Designed to hold a "C" cylinder and a BVM on the back side with four clear vinyl pockets. Made of 1000 denier Cordura® nylon, the back side of the bags are nylon reinforced vinyl for easy cleaning and have self repairing #10 YKK nylon zipper with a storm flap. White 3MTM ScotchliteTM Reflective Material trim and a star of life. Color: Black or Royal Blue. Measures 15"H x 12"W x 7"D for 1,250 cu. in. of space. All of R&B Fabrications, Inc. panniers have been redesigned to simplify and speed the installation and removal of our panniers. We now use 2 inverted J hooks, which hang on the side rails of the rack and an elastic type bungee cord with an S hook to secure it to the bottom of the rack. If a #1310 Trauma/O2 Pack is used, it must be removed first. We recommend a heavy-duty rack, which mounts in the seat area and attaches to the frame in the axle area. 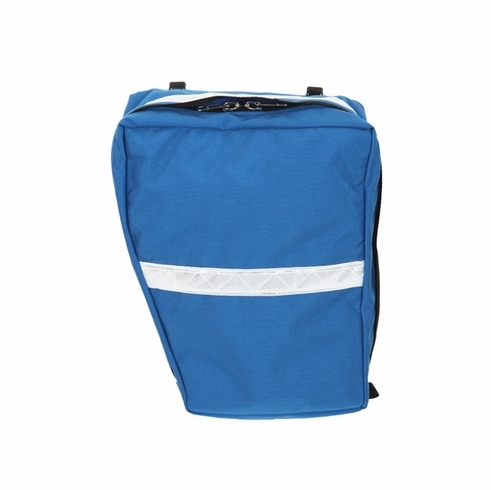 Our line of Bicycle Pannier has been designed by James Bowell of Troy Fire Department in Ohio. His expertise as an instructor and experience in this field has helped us to provide you with the best there is.